structure of mammary ducts of human breast tissue. Image from Rios, Visvader et al, Cancer Cell. Using a laboratory model of breast cancer, the researchers were able to view tumours in three dimensions, at previously unachievable high resolution. This revealed how cancer cells develop from pre-cancerous cells in the mammary ducts, and changes that occur in the tumour over time. The research, which was published today in the journal Cancer Cell, suggests that breast cancer cells are inherently changeable, morphing from one cell type to another at the molecular level – resembling cells that are more likely to spread. A new imaging technique has provided detailed new views of cells in tumours, revealing the changes that occur as breast cancer develops. The research revealed that ‘pre-cancerous’ cells in the mammary gland only rarely develop into cancer cells, but that once a cancer forms, the cancer cells appear highly ‘changeable’, a feature that may promote resistance to certain therapies. The transformation of normal cells in the mammary gland to cancer cells occurs in many stages, with ‘pre-cancerous’ cells evolving into early-stage cancer cells, which may then undergo changes that make the cells more likely to spread away from the tumour. Until now, it has not been possible to visualise individual clones – ‘sister’ cells that descended from a single pre-cancerous cell – within a whole tumour. pre-cancerous clones developed further to form a tumour. Imaging technology enabled the research team to examine the frequency of pre-cancerous cells that develop into tumours in the mammary gland, and address the behaviour of cells within tumours. The study was led by Dr Anne Rios with Professor Jane Visvader and Professor Geoff Lindeman at the Walter and Eliza Hall Institute. “Using a new imaging technique, we revealed that only a small proportion of pre-cancerous cells will develop into tumours,” Professor Visvader said. “In contrast, once a tumour has been formed, we discovered it was very likely for its cells to undergo a so-called ‘epithelial-to-mesenchymal transition’ (EMT). This is a change in the ‘molecular landscape’ – the genes that are switched on or off – within the cell, transforming it from an ‘epithelial’ form, to a ‘mesenchymal’ form that could have a growth advantage. allows researchers to see into tissues at high resolution. “If EMT frequently occurs in breast cancers, it means the cells are a ‘moving target’ – they can evade one set of weapons we have to fight the cancer, meaning we need to develop strategies that are more broadly targeted,” said Professor Lindeman. “Until now it has been challenging to visualise the intricate structures of complex tissues such as breast tissue, or to see the true arrangement of cells within tumours,” Dr Rios said. “We developed a new, rapid way to prepare tissue samples that retains their intricate architecture but allows us to distinguish individual cells and the three-dimensional structure of the tissue. of mammary ducts in human breast tissue. “Our method enabled us to capture previously unseen images of breast tissue and mammary tumours – this was crucial for us to discover the frequency of EMT within the tumours. “We expect there will be many other applications for our new imaging method, to study normal and cancerous tissue samples,” Dr Rios said. The research also involved collaboration with the Institute’s Centre for Dynamic Imaging and Bioinformatics division. The research was supported by funding from the Australian National Health and Medical Research Council, the National Breast Cancer Foundation, Cure Cancer Australia, the Australian Cancer Research Foundation and the Victorian Government. Three-dimensional view of the structure of a mammary duct. 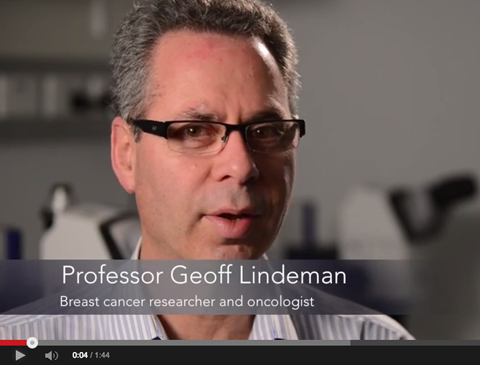 Video from Rios, Visvader et al, Cancer Cell.